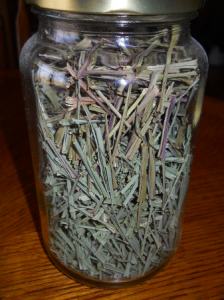 One of my favorite herbs that I grew in my herb garden this last summer was Lemongrass. 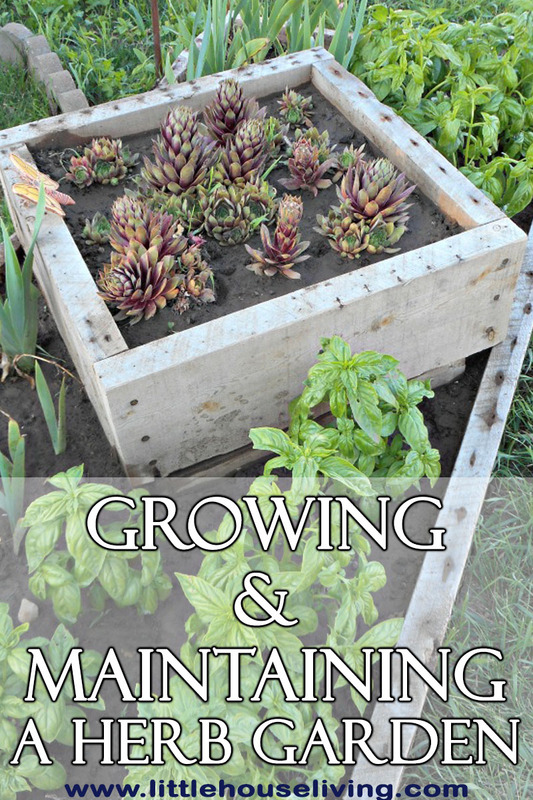 Actually, I didn’t grow it directly in my garden, but rather in a large container outside by my garden. 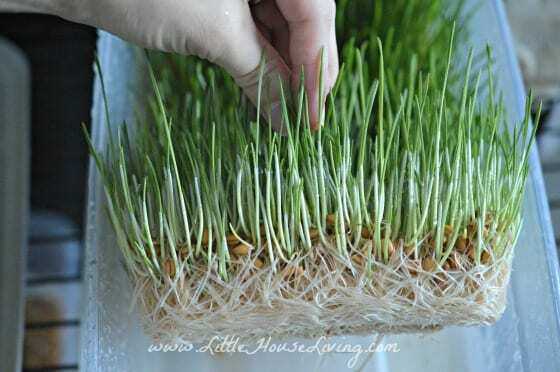 You can get Lemongrass as a seed to start (it’s very inexpensive, you can find 500 Lemongrass Seeds for around $4.50) or also a starter plant from your local nursery. Mine did very well throughout the summer, so I decided to bring it in for the winter and see if I could keep it going. It has done beautifully. 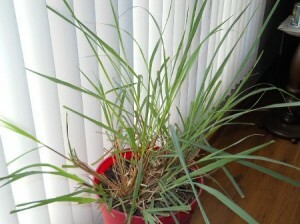 Here is a picture of my Lemongrass right now. I love using Lemongrass in teas. You can use it plain or add it into a loose tea mixture. I wanted to grow my own, since I do mix up the tea mixtures in bulk. Otherwise, you can order Lemongrass from the Bulk Herb Store. When I first started, that is exactly what I did. 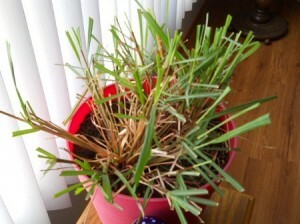 Now, I harvest my own Lemongrass. I trim the Lemongrass plant back to approximately this size, using kitchen shears. Then I further trim the long pieces to approximately 1 – 1 1/2 inch pieces and place them on my dehydrator rack. I dry them in the dehydrator for approximately 2 – 4 hours, or until dry, depending on your dehydrator. If you don’t have a dehydrator, that’s ok….just place them on a clean towel or plate to dry thoroughly. They will take just a bit longer this way. After they are dry, I place them in a glass container. They can be used to make Lemongrass Tea. 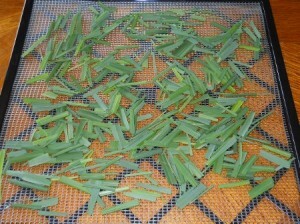 I actually like to make a bulk mixture with the Lemongrass that we enjoy. 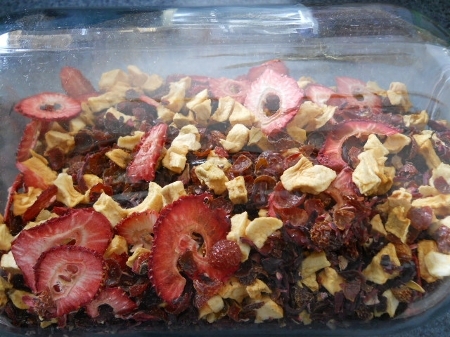 I mix approximately equal portions of Red Rooibos, Lemongrass, Bilberry, Orange Peel and Rose Hips. If you don’t grow and harvest your own, you can purchase all of these through the Bulk Herb Store. I mix this combination together and place it in a gallon glass jar. It is a loose tea that can be served hot or iced. It is one of our favorite combinations that we use. 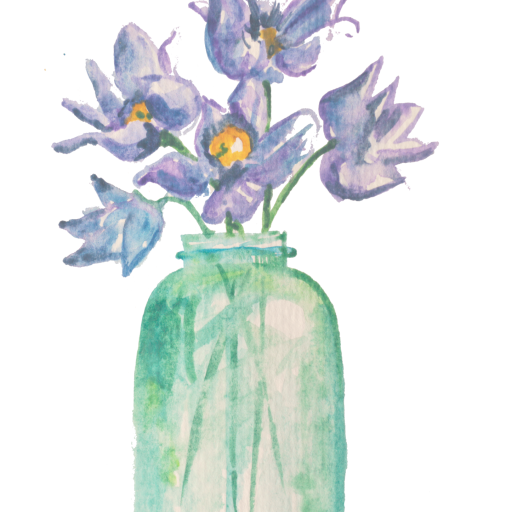 It also can be mixed up and placed in smaller, decorative glass jars to give as a gift! Enjoy!! 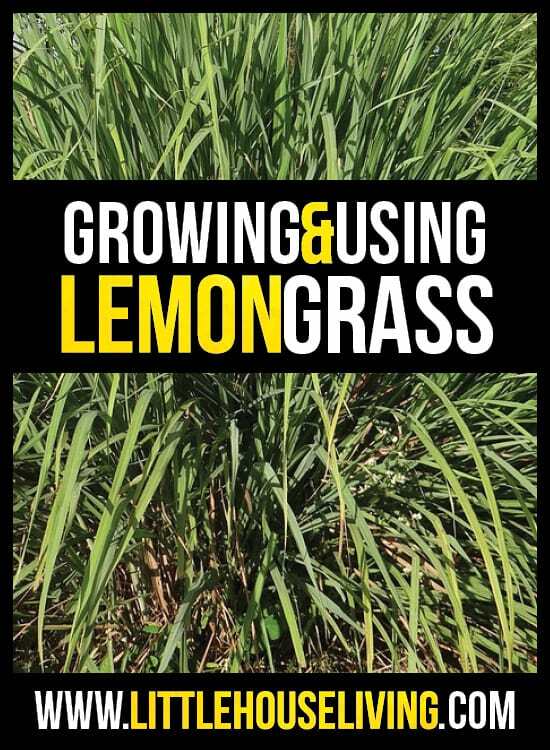 Have you ever tried growing and using lemongrass? Great ideas! Lemongrass is also good when cooking rice, simply tie a few pieces in a knot, then toss in the water you are cooking the rice in. Tying it presses out the flavors a bit more. It’s a wonderful flavor to add to an Asian rice recipe or even to Lemon Chicken!